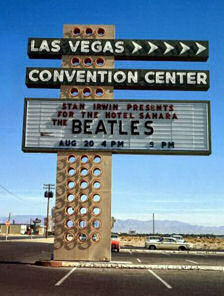 The Beatles performed two concerts in Las Vegas, Nevada on August 20, 1964. The stopover has become the stuff of Beatles legend, with a bizarre arrival, insane fan hysteria and wild rumors that persist to this day. We've gathered many resources here for you to learn all there is to know about The Beatles in Sin City. Our primary source of information is Chuck Gunderson's excellent book "Some Fun Tonight," which you can order by clicking here. 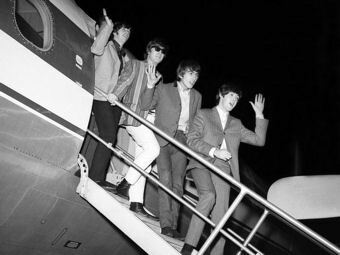 The Beatles arrived in Las Vegas by private charter plane at 1:35 in the morning at McCarran Executive Field. It was a poorly kept secret and several hundred fans were on hand. Extra police were called in to restore order after a near-riot. 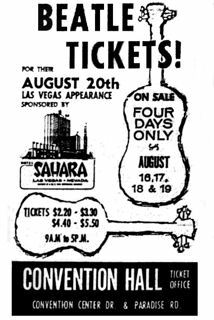 Tickets for the concerts ranged from $2.20 to $5.50 for the general public with some higher-priced VIP tickets sold. Today those ticket stubs (particularly unused) are among the most highly-valued of all Beatles collectors items. After resting up from the previous night's concert at San Francisco, the band found themselves holed up in room 2344 of the Sahara Hotel on the Las Vegas Strip, unable to freely move about because of the mob of teenagers at the hotel's entrances. 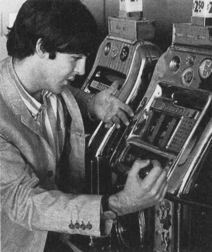 The management arranged for slot machines to be brought to the Beatles' hotel rooms. During the wait before the concerts police received at least one bomb threat and there are unconfirmed reports that at least one band member was able to escape and check out casinos up the Strip. And then came the show! 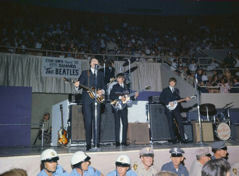 Following an early afternoon sound check and backstage news conference, The Beatles took the stage at the Las Vegas Convention Center Rotunda at 4:00 for the first concert. Police presence was heavy and there were no empty seats for either show inside the 7,000 seat hall. The group did the same set both concerts, but added "Till There Was You" at the end of the afternoon show. The legacy of The Beatles' weird, exciting visit to Las Vegas lives on. 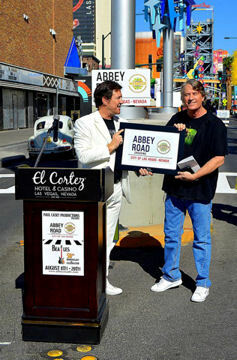 For the 50th anniversary of the concerts in 2014, the city dedicated an "Abbey Road Crossing" on Fremont Street downtown. Ringo and Paul regularly make Las Vegas a stop on their current tours, and Cirque du Soleil's "LOVE" show remains among the best-selling shows on the Strip. 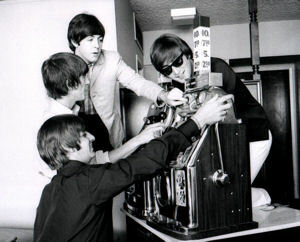 "Dennis Mitchell's Breakfast With The Beatles" started in Las Vegas and has been based there since 1991. For one of the best accounts ever compiled of the Las Vegas Beatles concerts, get Chuck Gunderson's book "Some Fun Tonight," which features many previously-unreleased photos and a copy of the group's contract for the concerts. Order your copy here. 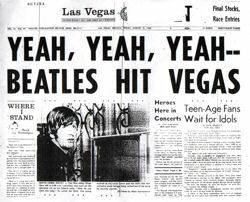 Beatles Best Friend Tony Bramwell has a fine Beatles In Las Vegas feature page at his website here.